Here we go again. 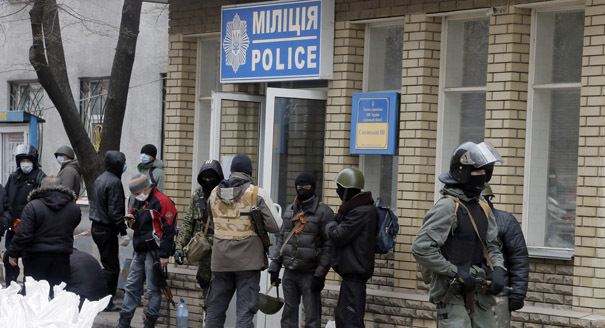 Today, ‘armed men’ dressed in the uniforms of Ukraine’s defunct Berkut riot police have seized control of the main police headquarters in Donetsk. In Slovyansk, men who seized a police station there are demanding a referendum which could lead to possibly autonomy for the eastern Ukraine or, worst case scenario, annexation by Russia. In the absence of countermeasures by the Ukrainian government, pro-Russia agitators continue to undermine the authorities in the eastern region, increasing their boldness with every step. As I’ve stated in the past, we have been down this road before and know where it will lead. The Ukrainian government is not responding effectively to this latest provocation, continuing the pattern that began back in March. To be fair, the fledgling government in Kiev was still getting its bearings when the crisis with Russia erupted over a month ago. That excuse no longer holds weight. Almost three days ago, Ukrainian leaders warned that the protests would be stopped in 48 hours, either through discussion, or force. Thus far there has been no sign of a move in either direction by the Ukrainian government. That might change soon. Acting President Turchinov has called a meeting of his government’s national security council. With talks between the US, EU, Ukraine and Russia scheduled to begin this coming week, Turchinov’s response options are limited. If he orders his police and military forces to go in and reclaim the occupied buildings it may collapse the talks before they even begin. Further, it can provoke Russia to intervene with military force. On the flip side, doing nothing will only embolden the protesters even more, encouraging them to claim more control over the eastern cities and go into any future discussions with the Kiev government from a position of strength. Previous Post: Thursday AM Update: Ukraine’s Ultimatum To Protesters. Is This The Excuse Russia Has Been Looking For?